Metrix competition registration has lots of different options to properly manage different types of competitions. 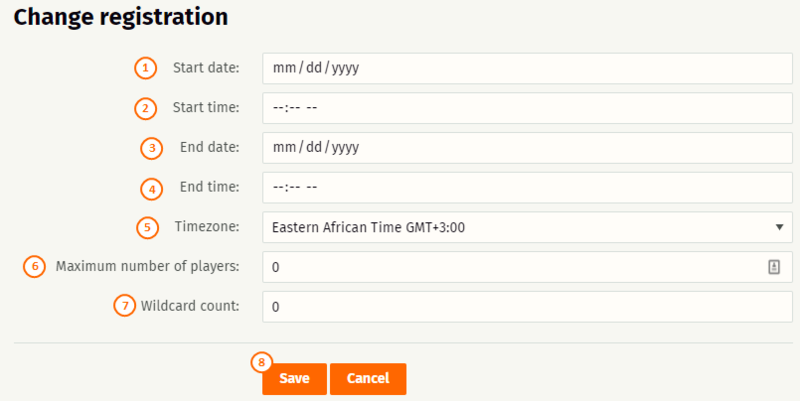 Turn on registration by selecting "Yes"
First settings are related to registration schedule and the amount of players. These will apply when "Players registration" is set to yes. And will not change that value. So, competition admin still has to "end registration" and show results from the competition settings. Wildcard count: Number of wildcards reserved by the organizer. This is excluded for maximum, so the maximum should include wildcards. Save: remember to save changes. Maximum number of players and Wildcards only make a difference in Premium competitions. In the free version, these details are just informative to the players, but in Premium competitions, system will take care of the waiting list based on these settings in addition to conditions defined for different registration stages. TD can choose what information is asked from players when registering into an event. If player has already filled some of these details into player profile, those will be used as default. So, no need to fill in birth year over and over again. Birth year: Used for registration conditions when some of the divisions have age limitations. PDGA number: Used to check PDGA license status and current PDGA rating. Metrix will query PDGA details at the time of registration based on the given PDGA number. 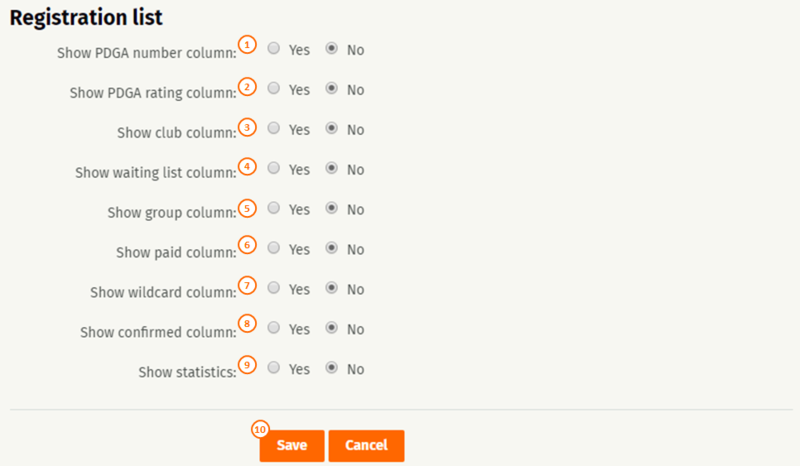 Country: Country is used for statistics and can be shown in the results list. Country can be used for registration conditions also. Exclude/include certain countries in different stages. Club: Player's club. Can select from any club where player is a member in Metrix. Phone: Player's phonenumber. Just as information for event organizers. Email: Player's email. Each player should have email in player profile already. Used for communicating event related information. Whether mobile is used...: Whether player has and can use mobile device to enter scores during the round. Nowadays assumption is that all players can do it, but not always the case in international events or with younger junior divisions. Ask food: Event organizers can setup different food options for players to choose from. Food option values are only available in the Excel export, not in players list! Ask for comment: One extra question to players. 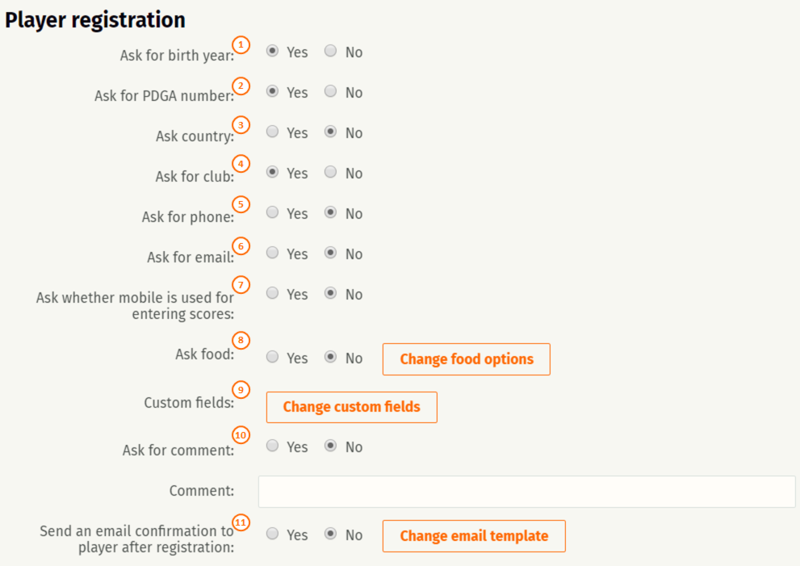 Added comment acts as a question on registration form. Send email confirmation...: Event organizers can prepare an "welcome email" to registered players to communicate important information to players before the event. Like payment details, important dates etc. After asking different details from players, in this section TD can choose which details to show in the registration list. PDGA number: Show player's PDGA number. PDGA rating: Show player's PDGA rating before the event. Waiting list: Show "queue number" for players on the waiting list. Group: Shows players' groups, after TD has created the groups. Note that there's also another view for showing groups in a separate page. Paid: Show if player has paid the event fee or not. Wildcard: Show if player has been given a wildcard. Players with wildcards will always get a spot in the event. Giving wildcards after division is full, may impact the status. Confirmed: Show if player has confirmed his/hers participation in the event. TD can for example mark confirmed, when players show up in the morning. Statistics: Show registration statistics at the end of the registration list. TD can define different conditions to different divisions and split the registration into multiple phases. For example set declining rating limits for different phases. See Registration conditions page for more information. Metrix supports using PayPal for players to pay for the event fee. Payments are simply routed to PayPal and Metrix doesn't have anything to do in between. See Payments via PayPal for more info.